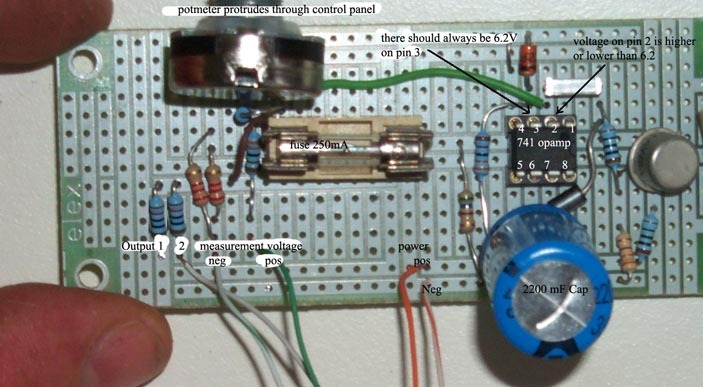 This is about an alternator regulator you can build yourself for a few dollars, suitable for charging deep cycle wet, gel, or nickel cadmium batteries for boat, camper, or whatever. Schematic and photo at the bottom of the page. There are several reasons why you might want to make your own regulator as opposed to buying one. There are some good regulators on the market, but they are expensive. None of them do all the things I wanted, or I would have bought one instead of doing all the work of developing my own until it actually worked. With a manually adjusted regulator, you can tailor the load to the engine, for instance if you have a small engine driving several large loads, you might want to reduce the charging load while other users are on the engine. For instance a generator engine that may or may not be carrying a large A.C. load. With this set up, you can regulate two or more alternators at one time, on the same engine or on different engines. Three-step charging has to be done manually by adjusting the knob a couple of times during the charging process, which the expensive regulators will do for you automatically. And of course you can charge ni-cad banks with this easily, and run compensation charges on lead acid batteries. Mainly, my design incorporates temperature protection of the alternator[s], which is unavailable on any off-the-shelf three stage regulator that I've seen. They tell you to install an alternator so that it can't be overloaded. However, if your alternator will develop full power at low engine RPM [desirable if it's on your propulsion engine], then it will be capable of melting itself at higher RPM. To stop it from doing this, original in built regulators limit the current when they heat up. The very best external regulators have current sensing, which you adjust to the maximum rated output of your alternator. However, in higher ambient temperatures, or if belt slippage is causing extra heat to be conducted down the shaft into the alternator, you'll be able to stir it with a stick. Some authorities say to install an alternator that is so big, it will never be overloaded. But if you have a large battery bank, and a large load possibility [inverter, say], you'll need an alternator that is much bigger than you may want to install if you follow that logic. If you're having any kind of mechanical trouble, you may want to be able to charge a large battery bank slowly, with less load to the mechanical system. You may want to run your engine without any load at all. A manually adjusted regulator gives you all kinds of control. It's not for everyone, but if you're a control freak like me then you'll love it. My intention is to have a robust electrical system on a moderate budget. By building my own regulator, I also have the knowledge to repair it easily. I use secondhand alternators; I keep a spare or two, since they are so affordable. So far, I haven't needed one. By using two 80 amp alternators, instead of a single large one, there is inbuilt redundancy, and greater cooling area . Marine applications running gasoline [Petrol, Benzine, or whenever it may be called where you live] require special spark proof electrical equipment in the engine room! I speak here for diesels. It is important that each alternator should have two belts! Single belts are for charging starting batteries in cars. I haven't had the pleasure of working with those new wide multigrooved belts; I think one of those should have no trouble at all. a 12 volt 80 amp Deco Remy, a couple of 12 volt Bosch 80s, and a 24 volt Leece-Neville 60A. I'm interested in anyone's further development of this design. Please let me know if you use it and what you think about it. I added a battery sense NTC Thermistor of 1k value, this was inserted instead of the pot sense to battery voltage, I replaced the 3.3K resistor with a 1.5K resistor then in series added a small 1K pot and then the 1K NTC giving a total of 3.5K and I set the pot to allow a maximum of 15V at the main pot. With this set up, I have the unit set to 14.6v and as the charge increases and the temperature of the battery rises the battery voltage bleeds back to 13.8, this generally occurs after an hour of motoring. It's important to have a digital volt meter installed, with its own wires [which can be shared for the reference circuit of the regulator] directly to the battery or the user side of the battery switch. Even small users of a few amps can strip off some tenths of volts, which are relevant. The correct charging regime for wet lead-acid batteries is to let the batteries charge at 14.2 V until the ampage drops to 5 percent of battery capacity [so for a 400 amp hour bank, the ammeter is showing 20 amps and the volt meter is still at 14.2], then drop the voltage to 13.8 obviously, double these numbers for a 24 volt system. Those voltages are for 20 degrees Celsius [68F]; it is important to adjust for temperature. The batteries will heat up significantly if charging with a large alternator! You have to adjust the voltage downward for this. The formula is 0.03 volts per degree Celsius. So as the temperature rises five or ten degrees, you'll need to turn the charge voltage down 0.1 or 0.3 V; this makes a surprising difference to the current flow. And the battery temperature does rise ten degrees! Next to my digital ammeter and voltmeter, is a digital thermometer. The sender is epoxied to a ring that is bolted to the battery terminal. If your batteries are exposed to big differences in climate [if you sail or drive from the poles to the tropics] temperature compensation is vital. In very cold climates, you'll need to turn the voltage up. Make a graph and keep it near the control. There are two voltages, a 6.2 volt reference voltage created by a zener diode and a resistor, and a similar voltage split by resistors from the battery voltage. These are supplied to a 741 opamp. When the split battery voltage is lower than 6.2, the opamp turns positive, and feeds transistor 1. When the split battery voltage is higher than the reference voltage, the opamp switches the power off. The output of T1 goes to a ptc screwed to the alternator case, and then to the power transistor that drains the field coil of the alternator. I’ve installed several of these, and they work well. As the alternator heats up, the ptc’s resistance will rise, gradually lowering the field voltage and therefore the alternator output. This method of over current protection is the best, as it will protect the alternator in any climatic conditions. The main advantage of this regulator is that it can be adjusted at will, and the thermal protection afforded to the machine. Also, 2 alternators can be run from 1 regulator, even if they’re on different engines. A bosch 80A sistered with an 80A delco [on the same engine] put out equal currents, keeping temperature down, efficiency and belt life up [double belts are needed on alternators over 60A if they’ll be working hard for more than a few minutes at a time]. I use an electronic thermometer with a sender bolted to one of the battery posts; the charge voltage is then adjusted for the battery temperature and state of charge. I found there was some resonance in the circuit at some loads when the wires were long; the big capacitor takes care of that problem nicely. I’ve had some trouble finding a power transistor for a 24V application. 2 60V transistors burned out on their first tries; it seems there is a voltage surge when the field gets switched off. 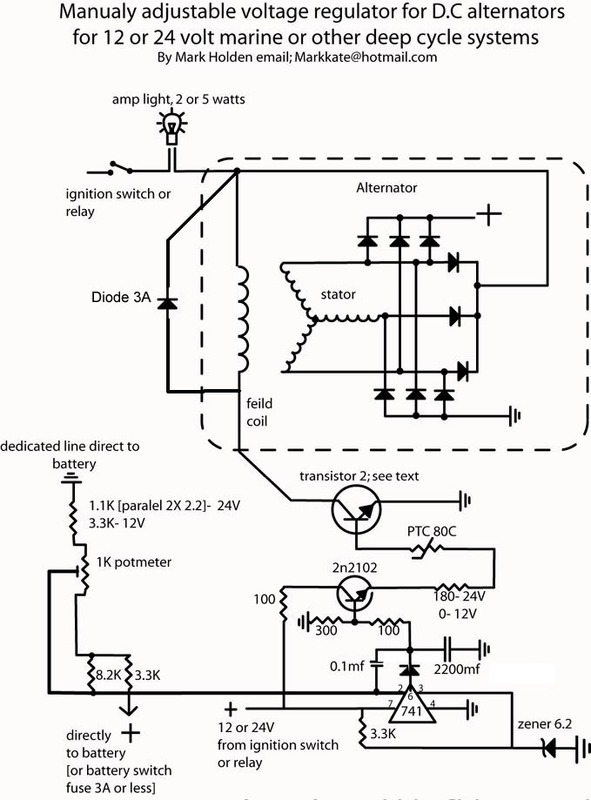 I've now added the recommended bleed diode to the diagram that should solve the problem. A 140V transistor [2n3773] is working well, but I’ve only tested it on a single alternator; I'm not sure if this transistor will be suitable to drive 2 alternators from the regulator [which I've done on another application using transistors I can't get any more]. I'll have to check the current between the transistors. The ideal would be about 100:1. A Darlington [750:1 or more] would be too reactive, and possibly make the ptc unable to taper the current at high temperature. If someone tries it and it works, let me know [you can heat up the ptc by putting it on a light bulb. The alternator output should fall, it will need some load for this test]. On the ic 741, pin 2 should have a voltage not far from 6.2 [say between 5 and 7 volts] that should move up and down as the potmeter is turned. Pin 3 should have 6.2 volts. Pin 7 should have battery voltage. Pin 4 should be earthed. The amplight should switch on and off as the volt adjustment knob [the potmeter] is turned back and forth. Start the motor with the adjustment all the way down, and watch the volts and amps as you slowly turn the adjustment up. You should hear the load as you pass the static battery voltage, and the system starts working. Turn it down again; the load [charging amps] should drop to zero as the charge voltage drops below the battery voltage. The marine electrical and electronics Bible, by John C. Payne. I learned a lot from this man. Boat owner’s mechanical and electrical manual, by Nigel Calder. Covers more than electrical systems, an excellent book. Wiring 12 volts for ample power, by David Smead and Ruth Ishahara provided some additional information. This book likes to sell you expensive components, but it is clear and fair. The PTC is usually a tiny little delicate thing. I epoxy it to a ring terminal and bolt it to the alternator case. I love my deco alternator, but it's necessary to split the cases. It's quite easy. It was a long time ago, and I can't remember the details; but you can clearly see the little diode bridge that feeds the regulator. Bypass the regulator, so that the diodes feed the brush directly. I can't remember exactly what I had to do to bring a wire from other brush out of the case, instead of letting it earth to the case; but it wasn't very hard. Here's the big trick with Delco alternators; use a pin or a small nail through the hole in the back of the case to hold the brushes back while you reassemble the cases. When they are assembled, pull the nail out. The Leese-Neville 24V 60A unit I have is military spec. It's very easy to work with, since there's a lot of space under the back cover. It's easy to find the wires and connect them any way you like. I mounted the transistor on an insulator on the back cover. This alternator produces rated output at only 1200 RPM. It can destroy itself easily at higher speeds if unregulated [not to mention what it might do to the rest of your electrical system!]. field current is about 2.5 amps. It's important that all connections should be robust. They should be capable of withstanding heat and vibration. Wires should be thick enough so they don't heat up appreciably [16mm square is nice]. They should be supple enough so that they don't stress the connection studs. Tie wrap them to the case for good measure. I crimp my connectors, and solder the tips of the wires to them [if any solder runs up the wire, it will become rigid in that area, and stress the connection stud], and then I cover it all with 3M shrink tubing. This stuff has heat melt glue on the inside, and is wonderfully thick and tough. Most authorities recommend fully tinned wires for boats intended for saltwater; if your budget can handle it. Personally, I just fill the open end of the connector with solder. It takes practice to avoid letting the metal run up the cable. It's about heat control; the ring area should be hot enough to melt the solder, while the back of the crimp section should not be hot enough to melt the solder. The shrink tubing then seals the cable against moisture. Important; if the cable from the alternator to the battery becomes disconnected, bad things happen. First, the voltage to the battery drops back, then the regulator goes to max output. The voltage at the alternator will go VERY high, but has no where to go except through the power transistor and field coil. The amp light [if fitted] burns out, so you may not notice. After a few minutes, the field coil heats up and melts down, short circuiting; then the power transistor will burn out or even melt through [a steel case!]. So make sure you have a nice thick ring terminal, the connection is tight and free of corrosion, and the cable is well sized. Lithium grease will help prevent corrosion without impeding the connection. Check the cable and connections after the machine has been running at high output for a few minutes, and make sure nothing is getting too hot. Repair or replace the wire if it starts to fray or shows signs of overheating. I had to learn this lesson the hard way! Here's a transistor I’ve found that should work. As I said, the gain may be too small for a double alternator installation; if anyone tries it before I do, please let me know. This information is correct to the best of my knowledge, but I can make no guarantee that what worked for me will work for you. I know nothing about local rules or laws; nor about what anyone's insurance company might think about self-made parts. All information is that the users risk!